Can your dragon die, as in you permanently loose your dragon, if you use the quest portal? No. The only way a dragon can die die is from harvesting it at the slaughter mill. Not trying to revive an old thread but I have a question. If you die in quest portal will it go to the medical station? Correct. It'll be listed as Quest Trauma. does the quest portal has limited life? can we have more than one quest portals? No. 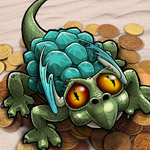 Once you purchases the Quest Portal from Cogg's Coop you will be able to send in a a single dragon daily. No, the Quest Portal is one of the structures like the Training Grounds or Slaughtermill. Once you have one you can use it once a day with an adult dragon that is not in the med station. I bought a Quest Portal and used it twice. It's been several days since I used it, but it tells me "There is no adult dragon available to use the Portal." Well, there should be; my dragon's right there, ready, willing and able. I thought you only had to buy the Portal the one time and then you could use it once a day. You were right with your thinking... You can use the portal once a day once you buy it. The only thing that I know of that makes your dragon unable to enter the portal and give the "no adult dragon available" message is if you entered a battle with it and are still waiting for an opponent. Perhaps that is the case here? It does look like that was your issue. I went to the Dragon Battle Records thread and it shows that your dragon had a battle 10 minutes after you posted in this thread. On this day, Arachne's Cloudburst "Alto" has defeated dlg74's Snagon "Brutus" with 26 health remaining, bringing his total victories to 1. Edited by nikkums, 06 February 2017 - 10:58 AM.